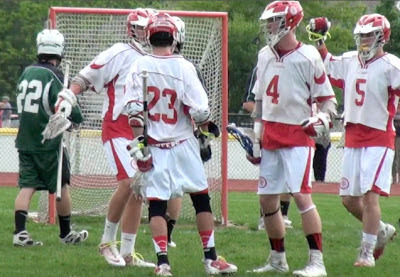 As I mentioned before, it was a banner year for Central Mass lacrosse, and my buds over at ESPN Boston took notice, ranking three CMass squads in their postseason Top-25. Central Mass champion St. John's was the region's only Top-10 team, checking in at No. 8, while runner-up Grafton finished at No. 12. After struggling with early season injuries, Algonquin managed to get healthy for the regular season's home stretch and playoffs. The T-Hawks won six of their final eight (Only two losses to St. John's) to advance to the CMass semifinals and earn a No. 23 ranking. The T-Hawks have now finished as a consensus Top-25 team in the state the last three years. The poll also lists a "Last 10 Out" that includes Shrewsbury and Westboro. Shrewsbury held high-powered Grafton to single goal in the first half of their CMass semifinal game, but were unable to hold off a second-half surge by the Indians. Westboro, on the other hand, was dealt a hard draw and had to face St. John's on the road in the quarterfinals. After winning the Division I crown, Xaverian was named the state's top team. While it is certainly hard to argue with awarding the winner of the state's toughest division the top spot, I would have gone with undefeated Division II champion Longmeadow. The Lancers were flat-out dominant this year, and the only common opponent they and Xaverian played that I know enough about is St. John's. The Pioneers defeated Xaverian, while falling twice to Longmeadow. That, in my admittedly incomplete opinion, is why I voted Longmeadow No. 1.